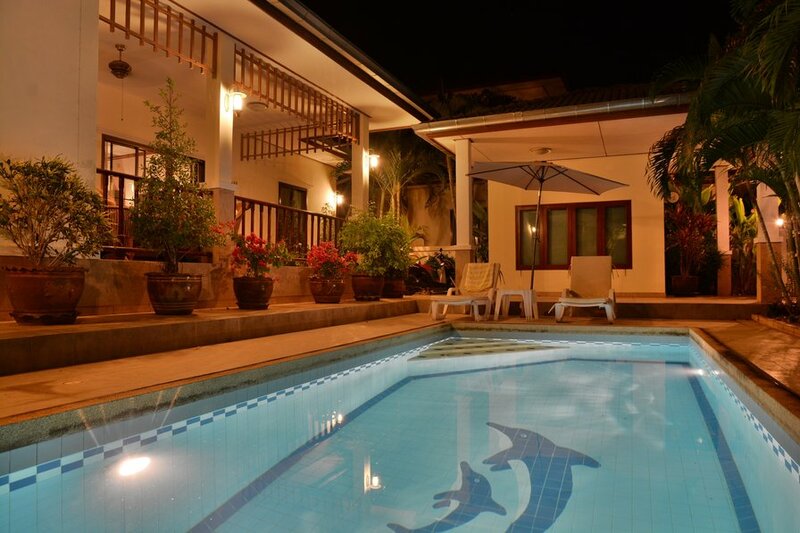 High Luxury, bright and breezy open plan villa situated in a 5 * resort. Well-equipped, privat pool, SPA, have its own solar electricity, water cleaning system, close to restaurant, golf, and beach. The house is open plan, which allows the light cooling breezes to circulate the home. It has a lounge, dining area with European kitchen, and three large double bedrooms all en-suite. The lounge, which is air-conditioned, has double patio doors leading to both the front & rear terraces, and is furnished with one large very comfortable leather sofa, swan chair and table: In the evenings the room has a a beautiful cosy atmosphere from many table lamps. There is a large 60`` 3D screen LCD, satellite TV & DVD player with home cinema whit free DVD films for use, Apple TV so you can stream your own programs, Playstation 4 and wii gameplay, and Internet radio so you can hear your favorit radio station or listen to your on playlist from MP3 or Smart phone. A IPAD is also placed in the living room for free use. The dining area, which is air-conditioned, is adjacent to the kitchen and has a large table and 6 dining chairs and the dobbelt patio doors leading to the rear terrace, which has a large dinning tabel and chairs plus a large gas barbecue. Cozy garden whit light and water fontain. The master bedroom, which is air conditioned, contains a king bed, build in wardrobe with, chest of drawers, bedside tables, lamps, a large wall mount 52" LCD TV with surround sound and DVD/CD player and Apple TV. Leading from the room is a large en- suite bathroom with SPA, rain & soft shower, two vanity sink with mirror & and wall mount toilet. Washing maschine and dryer. There is air-con in SPA bathroom. In the room is also placed a spinning bike so you can get fit. Big closet for towels and toilet things. House have it own water cleaning system, so you can drink the water from the tap. Bedrooms 2 & 3 are also air conditioned, very spacious & both contain king beds, double wardrobes, vanity units, hairdryer. TVs for playing DVDs & CDs . Both rooms have en-suite facilities incoporating rain & soft showers, vanity sink units with mirrors & WC's. All bedrooms have blackout curtains ensuring daylight does not interupt your sleep. There is a storage cupboard situated off the lounge, for bedlinnes and electronic safe for your valuables. When you check out Naturall Hill staff will check the house and count how much you have use of water and electricity. Because the produces it own electricity ,The price is ONLY 5 bath pr units of electricity. and 48 bath units of water a day. That means low cost for you. If you need a car you can also rent my 4 person Toyota car which has automatic gears.